A legendary fighter, martial arts artist, six time world champion: WMTC ('96), IMF ('96), World Drakka ('98, '99), ISKA (2000), IKKC ('02, '06), IKF Full Rules Muay Thai (2008) and professional boxer. Manu is a top ranked former NABA, NABO and IBA contender. Manu spent 10 years training under "golden legs" in France, before going to Thaliand. when he was seven years old. Training Judo under Jean Marchi, he became a brown belt and the first French Champion under his instructor in 1982. 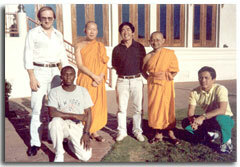 Later, Manu began training Viet Nam Kung Fu under Mukanda Celestin (best student of masters Luc Van Tan, Ly Sary and Lee Chezarack) becoming a 1st degree black belt and a three time French national champion. At eighteen, Manu became the youngest man in France ever to be awarded a blackbelt in Viet Vo Dao, a style similar to Chinese Kung Fu featuring lots of leg kicking in scissors fashion. His first French National Karate Championship followed soon after in 1984, and by 1988 totaled five in all including two won the same day in the 143 and 154lbs. weight divisions. This led to an invitation to join the national team of the French Federation of Martial Artists and soon thereafter a chance to turn pro on the kickboxing circuit with his first fight at the Hollywood Palladium in 1989. “Nobody trained like I did. It gave me such confidence that I predicted I’d win in the second round which I did by anesthetizing my opponent’s legs with so many kicks, he couldn’t stand up anymore and fell to the mat and couldn’t get up,” Manu says. where he defeated the #1 ranked Lumpini stadium champion - Super Rhino - AKA Neutherone. Under the famous Thai promotor, Songchai Ratan Saban, Manu gained recognition and stardom in the Thai arena of martial arts. As a muay thai fighter he is feared most for his legs. Manu uses both legs to dominate and destroy his opponent by KO, a rare skill among Thai fighters. This earned him the name --"Little Golden Legs" after his mentor Pud Pad Noy. Manu rapidly entered in the circle of the greats, like Rob Kaman, Ramon Dekker and Danny Bill. Most of his fights were televised earning him international recognition. 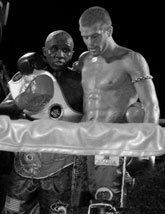 His reputation earned him an invitation from the DRAKA federation to fight for the light heavyweight on pay-per-view in Los Angeles, CA in 1998. This brought him to the states where he met Morris Smith, Cung Le, Rob McCullough, Tiki and Mike Nolte, the founder of Muay Thai Products. 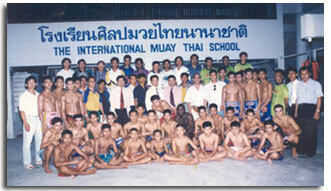 Manu was a member of the International Muay Thai School in Thailand where he trained for 3 years. 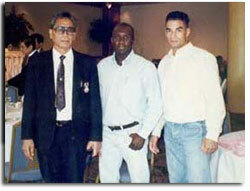 Manu trained with Kru Yodtong in 1995, 1996, 1997, and 1998 while in Thailiand. After winning the Light Heavy Weight DRAKA championship, Manu began his coaching career. 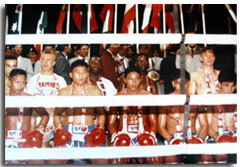 Under his training, Rob "Razor" McCullough became USMTA World Champion. Manu's friend, the great Cung Le, encouraged Manu to stay in the US and continue pursuing success as a fighter and trainer. He not only stayed, but was propelled to the forefront of Thai Boxing in the US when he was featured in Martial Arts Magazine as the "Shaman of Thai Boxing" in their April 1999 issue. 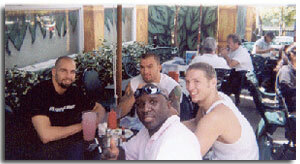 That same year, Manu came to Atlanta to train and coach at the Obake Fight School and Goldberg's Gymnasium. 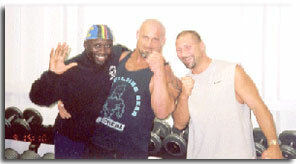 Working for Obake and Bill Goldberg, Manu soon had a team of professional fighters training under him for various mixed martial arts competitions. Not only did he offer private training, but soon had several classes filled with students at the Obake Fight School. During this time, Manu continued his own training. A visit from Bernard Hopkins inspired Manu to make a career move into boxing. With a new goal, new objective and new challenge, Manu embarked on a new phase of his world class fighting career- Boxing!